I always enjoy reading about different kind of product comparisons, it makes me easily figure out which one will suit my needs , so I hope this post will be interesting for those of you who are looking for a pressed powder. Ok, so let's start with packaging. Ives Saint Laurent 'Matt and Radiant' pressed powder (read my review Here) and Elizabeth Arden 'Flawless Finish' powder (read my review Here) have beautiful golden packaging, very luxurious look, while Lancome 'Translucence' Mattifying silky powder has modest , simple black packaging. Ives Saint Laurent 'Matt and Radiant' pressed powder is very lightweight and smooth, it's so light and silky that if I don't make perfect, even foundation, before I apply it, this YSL powder will not be able to cover imperfections. Elizabeth Arden 'Flawless Finish' powder is also lightweight, but it's not as smooth as YSL one, it's more like, powder-y, and it can cover little imperfections of the skin. But I personally wouldn't wear it without some foundation. Lancome 'Translucence' Mattifying silky powder has medium coverage. Since I don't have any blemishes, or wrinkles on my face, I can easily wear this powder without any foundation to get some light-to-medium coverage. it's not too smooth or too powder-y, (if this is the word I can use here). Which one I would repurchase? Definitely Lancome. I actually repurchased one time and will do it in future as well. Don't take me wrong, I love both YSL and Elizabeth Arden powders, I enjoy wearing them but not enough, to repurchase them. Have you tried any of these powders? Let me know in the comments below, and have a lovely day. 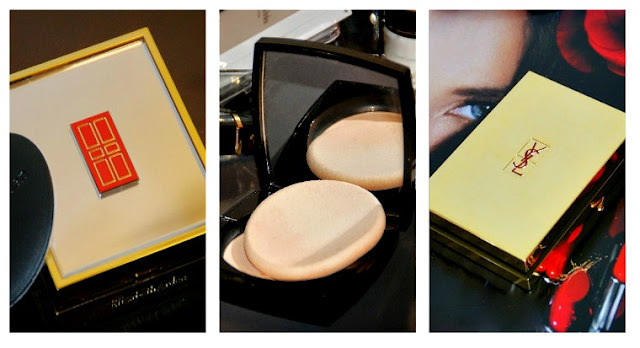 This review is beyond helpful as I'm planning to buy a new compact powder one of these days! Thanks for sharing! I've not tried these, but by the sounds of it I would choose Lancome too. I like wearing a powder without foundation sometimes. Yayy, such a wonderful comparison of products, Nina! I love finding great new makeup! Fab review! I prefer pressed powders. This is the kind of beauty blog that I like! I'm used to read reviews of low-cost beauty products, but I am way too worried about the components to fall for the price. My skin is sensitive and I only use this type of brands. The powder I'm using right now is Clinique oil-free, I really like the coverage, the only thing is it lasts only eight hours in perfect state, but my dermatologists says that's a good thing for my skin. I have never tried using only powder as base but I have seen many swears by it! The Lancome powder sounds promising, definitely something I'll check out. So great review i ve tried Saint Laurent powder it s so great! These sounds pretty good, I am thinking of going back to mineral foundation this fall. I like Jane Arydale. I think I also would go for the Lancome one, for the medium coverage. I don't really like foundations, so I like powder to give a bit of coverage, so the Lancome one seems better to me! I'm so glad you compared them. This is so good to know! The Lancome would work for me. All have such gorgeous packaging. I haven't tried any of these but I love Lancome!! Perfect review, thanks for sharing!!! Lancome has a lot of great products and I feel like they are underrated in the beauty world. A lot of women would go to MAC before they buy a Lancome product, only if they knew what they were missing out on. One of my all time favorite perfumes is by Lancome and everytime I wear it people go nuts over it. Awesome post love the detailed comparisons. Totally agree, I'd pick Lancome one too 'coz it works perfectly for my skin type. Great post! Some interesting products to check out! I'm a huge YSL fan! I love all of their products! And to be honest I prefer the YSL product! Thanks for sharing all of them! Useful tips for those looking for a powder. I would choose a silky one, or even a compact one for the cold days. Thanks for reviewing these! The Lancôme does sound amazing, I use this! I'm with you if you going to repurchase something it will be Lancome. Great review- the Lancome powder sounds brilliant! I definitely need to check out Lancome products more often. Every time I'm at a department store or Sephora, I always gravitate toward the other brands and skip over Lancome. Everyone always has nothing but good things to say about it. what a great review! I need to try out some of these powders! Lancome has great products! Most of my makeup items are from them! Gorgeous beauty blog! Great review! Thanks for sharing!